Geoff Campion (1916-1987) was a tax inspector, but when he was serving in the War as a staff officer in the East India Command, he started drawing cartoons for army magazine Jambo. In 1948 he started working as a comic artist for Amalgamated Press, doing humorous cartoons for magazine Knockout. 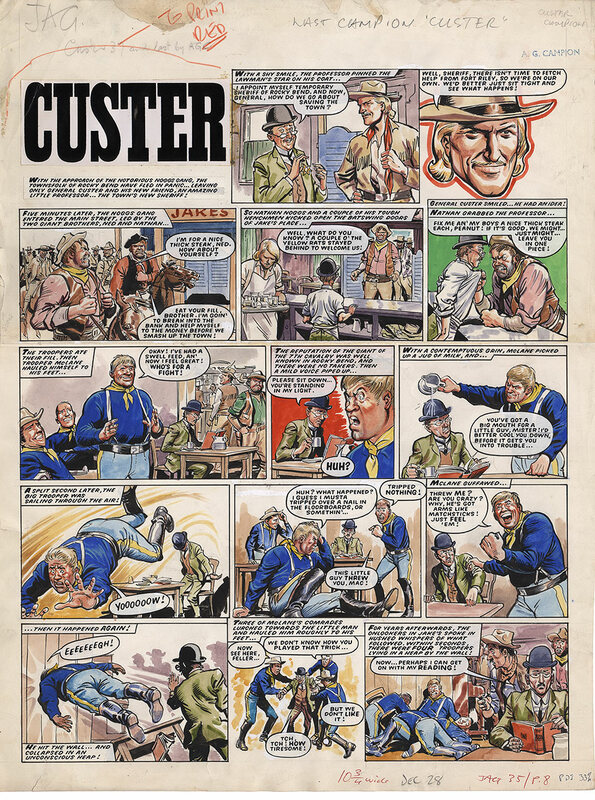 After that he drew westerns for Cowboy Comics Library and established himself as one of Fleetway’s leading adventure artists. He was drawing for magazines such as Battle Action, Lion, Comet, Sun and among titles he drew were ‘Spellbinder’, ‘Typhoon Tracy’, ‘Buffalo Bill’, ‘Billy the Kid’, ‘Kommando King’, ‘Tales of the Gold Monkey’, ‘The Cyclone King’.